A friend requested I “get crazy with some rhubarb” for his birthday. 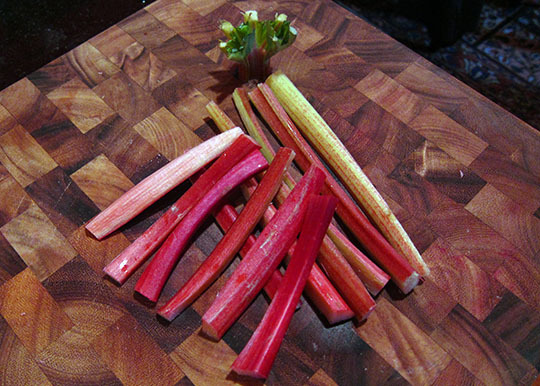 I was worried that I wouldn’t be able to find rhubarb in August in NYC, as a local availability website said the season was May-July. However, I found some the second place I went, a fruit and veg store down the block. The grocer who stands outside to tempt passersby with fresh fruit samples led me right to a small pile, which I quickly depleted. I made a rhubarb purée by cooking cut rhubarb with some water and a little lemon. I simmered until it was soft then used my hand blender. The purée went into both the cupcake batter and the icing. 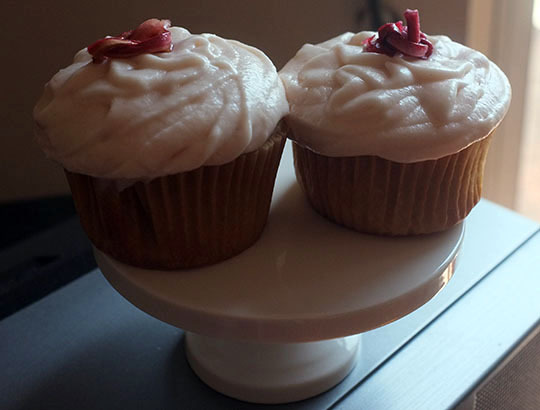 I candied some rhubarb to top the cupcakes. 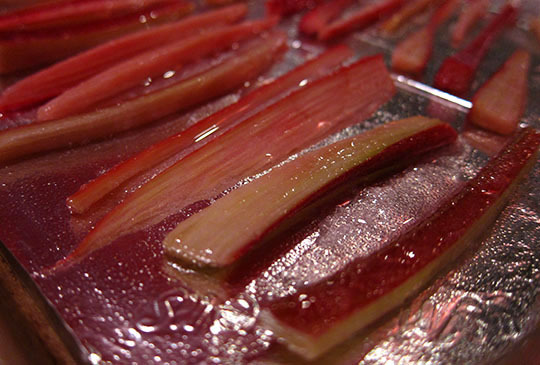 I made a sugar solution over the stove, dipping julienned rhubarb to coat, then arranged on a foil-covered pan. I baked these sticky strips in the oven at 200° for about 45 minutes. After removing the rhubarb from the oven, I shaped them into knots while they were still pliable, then left them out to harden overnight. 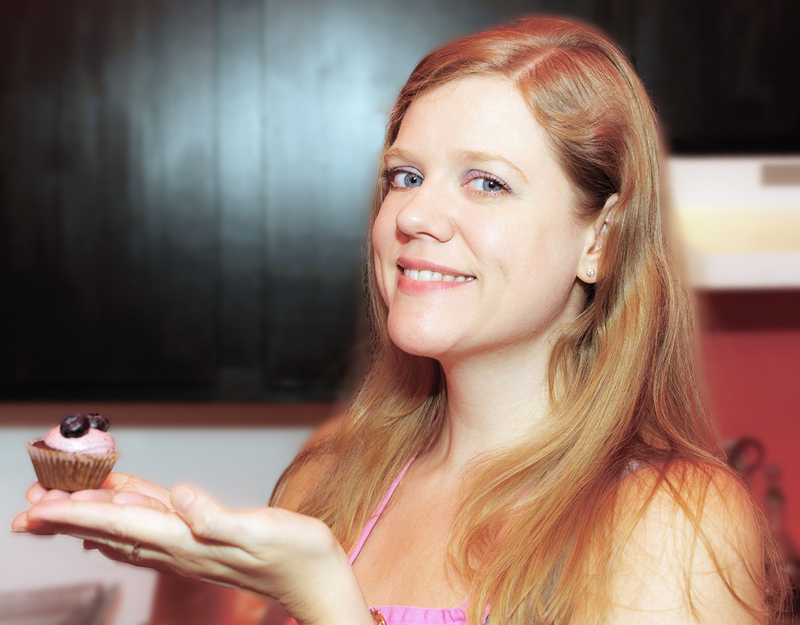 The cupcakes came out a little denser than your average cupcake, tasting almost like pound cake. The rhubarb flavor came through, which was the most important thing. For the icing, I used powdered sugar, rhubarb purée, and butter, plus a little cream cheese to give it extra punch. I hadn’t completely factored in the fact, though, that the purée and cream cheese might be too much moisture to get an icing consistency that would be easy to pipe. I prefer to pipe my icing because it is faster and usually looks nicer, but something I may have to face is that all types of icing are not meant to be piped! I did my best this time, though, adding some more butter and lots of powdered sugar to get what I wanted. 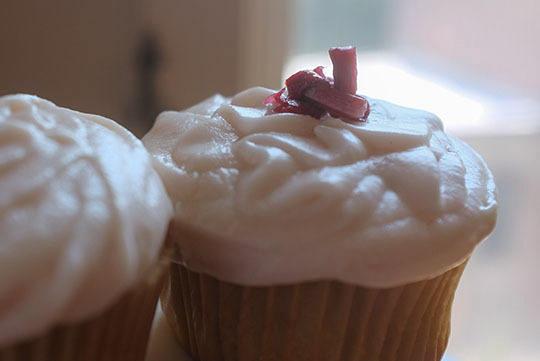 I stopped my additions before they overpowered the rhubarb taste, doing my best to pipe a good amount on each cupcake, topping with a rhubarb knot. Oooh, Bobby would have loved this–I’d better not tell him about it.